The Galactic Civil War rages on after the destruction of the Death Star and Luke Skywalker struggles to learn more about the Force without the aid of Obi-Wan Kenobi – or indeed without any aid at all. But the few memories he has of Obi-Wan’s instruction point the way to a stronger control of the Force, and he is encouraged to pursue it by a new friend in the Alliance. When Luke, R2-D2 and his new ally are tasked with liberating a valuable asset from the Empire and delivering her to a safe planet where she can aid the Alliance, their journey across the galaxy is fraught with peril – and opportunities for Luke to discover the mysteries of the Force. 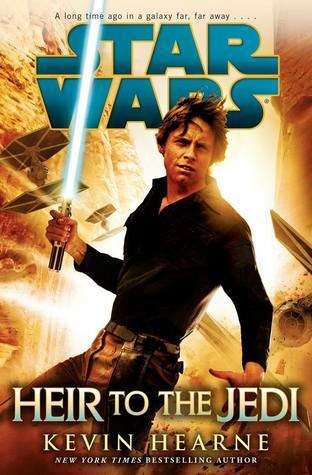 Heir to the Jedi by Kevin Hearne , the author of the popular Iron Druid series, is the third book in the Empire and Rebellion series. I have read well over 100 books in the Star Wars Expanded Universe and I still get chills of excitement whenever I read “A long time ago in a galaxy far, far away…..”. I love the stories of the iconic Star Wars characters while they were still young and finding their place. I especially like ones about Luke Skywalker. Luke, son of the infamous Darth Vader, founder of the new Jedi Order, and probably the most powerful force user in the galaxy. How does he go from unsure farmboy to Jedi master? How does he learn to master the force when everyone that could have taught him the ways of the force are gone? Heir to the Jedi gives us some insight into that. I had originally given this a book a 3 out of 5 but I went back and watched Star Wars A New Hope and bumped it up to a 4 because, for me, this book does have that “Star Wars feel”, that newness and excitement that I got from watching A New Hope for the first time. Yes, there are several few laughable, eye-rolling moments in the book, but for readers of Hearne’s Iron Druid series, this is one of his strong suits. I also liked the first person view from Luke’s perspective. Heir to the Jedi was a fast paced, hyperspace ride through the galaxy with a young Luke Skywalker coming to gripes with the loss of loved ones, and becoming part of something bigger to make a galaxy a better place. This Star Wars fan loved it. I received an electronic review copy from the publisher through Netgalley in return for an honest review. Posted in Book Review, New Releases, Star Wars. Tagged book review, new release, starwars.